Sakuya and Wakyo are reincarnated and reunited only to discover that Bishu-sama — their master and mentor from a past existence—is in their midst and in grave danger from vengeful demons! Still unsure of their own powers and the nature of their cunning and elusive enemy, they must race against time to rescue Bishu from the dark forces that roil within his reincarnated form. 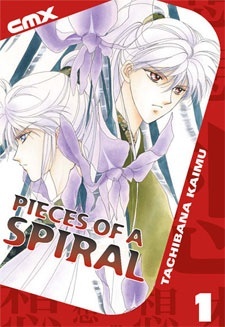 Rasen no Kakera was published in English as Pieces of a Spiral by CMX Manga from September 1, 2005 to December 31, 2007.